For the second successive away match, Matlock leaked two late goals to destroy hopes of a precious point being brought home from their longest trip of the season to Borough Park. The Gladiators had fallen behind to 5th minute Jason Walker goal and looked set for a long and painful afternoon. But Workington could not add further to their lead and a rejuvenated second half Matlock levelled four minutes into the second period through their stand-out performer Michael Williams. But goals from Conor Tinnion and Walker again in the closing stages, both from unnecessarily conceded free kicks proved to be decisive. It was a much changed line up for Matlock who were without both first choice centre backs in Adam Yates who was injured and Dwayne Wiley suspended. Alex Hurst and Ted Cribley were also absent while Jake Phillips was on the bench. Nineteen years old Dan Vann, signed on loan from Walsall on Friday came in for his debut at centre half, partnered surprisingly by Shaun Harrad, who was named as captain. Jack Brownell had a first full start at right back while Harry Vince and Jamie Jackson were back in the side, Jackson being the lone striker. Seventeen years old Luke Rawson, brought in on work experience from Chesterfield was a substitute. Matlock needed to make a solid start but after he had been caught offside in an earlier attack, WALKER fired the Reds in front. Steve Joel latched on to a pass from Tinnion on the left to cross low for Walker to convert easily with a low ground shot. Harrad escaped with a talking to after bringing down Walker as Workington continued to dictate the early play with several Matlock players not being at the races, one clear exception being Williams who chased everything with boundless energy. It needed others to follow his example. Walker headed wide from a right wing cross by Brad Hubbold before Hubbold forced Richard Walton into a fine save from a fiercely driven shot. From the loose ball the visitors cleared their lines with difficulty. Williams finally had Town’s first strike at goal on 29 minutes, although it was a tame effort which home goalkeeper Aaron Taylor comfortably stopped as Matlock now were coming into the game. They received another blow when Jordan Chapell had to be replaced after being fouled, Charlie Dawes entering the fray. Then Jamie Jackson limped off which meant a debut for seventeen years old Ashton Hall, who partnered Vann at the back with Harrad moving forward to his usual attacking position. Walton held a strike from Joel before Marcus Marshall should have at least managed a shot on goal as he advanced into the penalty box but dithered too long and the chance was lost. Matlock were out early for the second period and immediately looked more business-like. They were soon rewarded when Harrad, in space on the right volleyed a delicious cross for WILLIAMS on the run to head firmly past Taylor. Rawson replaced Adam Smith as Workington fashioned a couple of half chances as they sought to regain the lead but now Matlock were equally if not more dangerous. Brownell and Marshall had by now swapped roles with Brownell being further forward. They might have gone in front when good pressure from Dawes saw Jake Green surge forward to shoot low and Taylor was down quickly to save to his right. 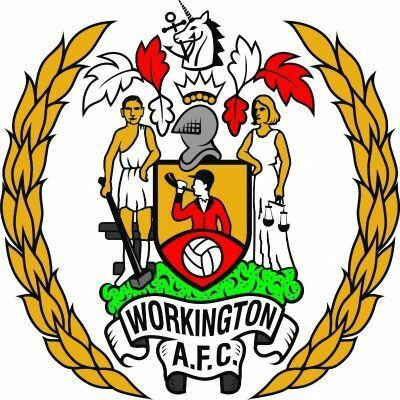 Another good opportunity came Matlock’s way but it was a case of too many cooks and the chance was lost as a free kick went Workington’s way. It was carelessness that led to Town’s downfall when a stray pass further up the field led to a quick break and a foul on substitute Kieron Maguire some twenty odd yards out. TINNION provided the capital punishment, curling his shot pin-point into the top corner, Walton, or any other goalkeeper for that matter, having no chance of keeping it out. Matlock had eight minutes to redeem themselves but similar circumstances led to the Reds third just two minutes later. This time nobody picked up WALKER and the striker signed from Chorley, wrapped up the points with a firm header. At the other end a fine cross by Harrad narrowly eluded the onrushing Rawson who like Vann and Hall, had done well on their debuts. Walton denied Walker a hat-trick with a tremendous point blank save. Now Matlock have conceded nine goals in three away games. They look too open when teams attack them and they need a more defensive minded midfielder to sit in and protect the defence in the mould of a Joe Doyle-Charles, adept at breaking up play. It’s easy pickings for the opposition and the generosity needs to stop before Matlock can look at improving their league position of fifth bottom.